Following on from Victor and Gord, which received a favourable reception from reviewers, Úna McKevitt’s latest production as part of the Project Arts Centre’ Project Catalyst is heart-warming and emotive but doesn’t sit well alongside its fellow Ulster Bank Theatre Festival productions. 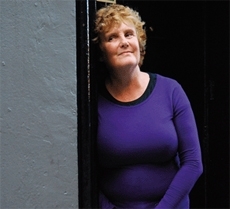 The play consists of Marie O’Rourke telling the story of her life, her abusive husband, her sunshine daughter, the untidiness of her home, how she would love to meet her deceased father again and most of all her love for theatre. O’Rourke’s narrative is written from the heart, but because it is so scripted, the performance is at times too forced. There is stiffness between what is a moving, true story and its performance, as O’Rourke recites rather than tells her story. It seems that perhaps O’Rourke has told this story too many times – she gears herself up for each punch-line and pulls faces as if she has practiced them in front of the mirror. Her story is beautiful, immensely emotional and humorous in parts, but I think perhaps the production is over produced. I think the presence and occasional prompt from the stage manager Duncan helped, as the play would otherwise have been a linear monologue which I don’t think O’Rourke could have carried on her own. I think that all the audience could easily identify with parts of O’Rourke’s narrative, especially her descriptions of her experiences in theatre attendance, however I think that perhaps it would have been better suited to the Fringe Festival as a work still in progress rather than the full on Theatre Festival. Just as Medea was described by some as a Theatre Festival production ill placed in the Fringe line up, 565+ suffers from a bad choice by the Ulster Bank Theatre Festival to include a production that I don’t think was ready for it.